On or about Monday, Oct. 19, Dulles Corridor Metrorail Project crews will begin excavation and foundation work for the Silver Line's future Herndon Station in the median of the Dulles International Airport Access Highway (DIAAH). The Station will be located north of the Herndon-Monroe Park & Ride facility located on Sunrise Valley Drive. 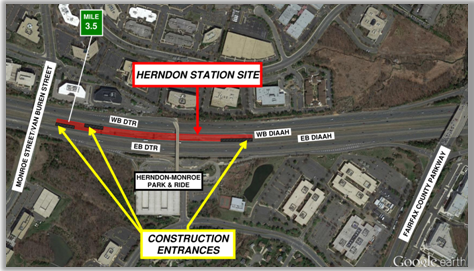 The work at the Herndon Station, like the ongoing activities at the Innovation Center Station site, located approximately two miles to the west, will require large, slow-moving vehicles and equipment to exit and enter the highway in the eastbound and westbound lanes at various times. Silver Line construction activity on the DIAAH will continue to build. More construction vehicles will be sharing the road and lane and shoulder closures will occur at various locations and times. For your safety and the safety of our workers, please slow down and drive very carefully, giving full time and attention to the road and the possibility of changing conditions. The existing Wiehle-Reston East Station (left) is the design prototype for each of the Silver Line Phase 2 stations that will be built on the DIAAH and the Dulles Greenway. The future Herndon Station (below), located approximately 2.5 miles from the Wiehle-Reston East Station, is being constructed in the median of the DIAAH.